My attitude to egg white-only omelettes is pretty much in line with the Nora Ephron quote above. After a major custard or ice cream making spree, I’ve occasionally attempted to scale the mountain of leftover albumen by making an anaemic omelette, but I’m almost always disappointed by the odd consistency and insipid flavour which result. Adding a little ricotta helps the texture, as does being bold with seasoning, but if you’re going to go to all that effort, I’m inclined to think you might as well include a less than harmless yolk. And if you do decide to eat an egg white omelette, you’re only going to use a couple up: it feels a little faddy and will likely be a meal for one rather than the kind of thing you serve to friends (unless you live in California, perhaps). Which means an excess of egg whites is usually best resolved with something sweet. Meringue is the go-to solution – baked into crunchy, chewy peaks, whipped into icing or folded into delicate macarons – but here a little egg white goes a very long way and unless you’ve got a lot of people to cater for, an enormous quantity of any of the above can be a little over-facing. Step in the financier. As well as being bite-sized buns of nutty, buttery bliss, financiers are an amazing way to use up leftover egg whites – a batch of twelve uses 120 grams, the equivalent of about four medium eggs. Up the quantities to make sixteen cakes and you’ve used up all the egg yolks from an average batch of ice cream. Traditionally baked in rectangles (like a little bar of gold, hence the name), financiers can also be made in the kind of muffin tin you’re more likely to have lying around the house, making life a lot easier. Beurre noisette, or brown butter, is an integral ingredient and along with ground nuts contributes to the gorgeous flavour profile – the texture crispy on the outside and moist in the middle. 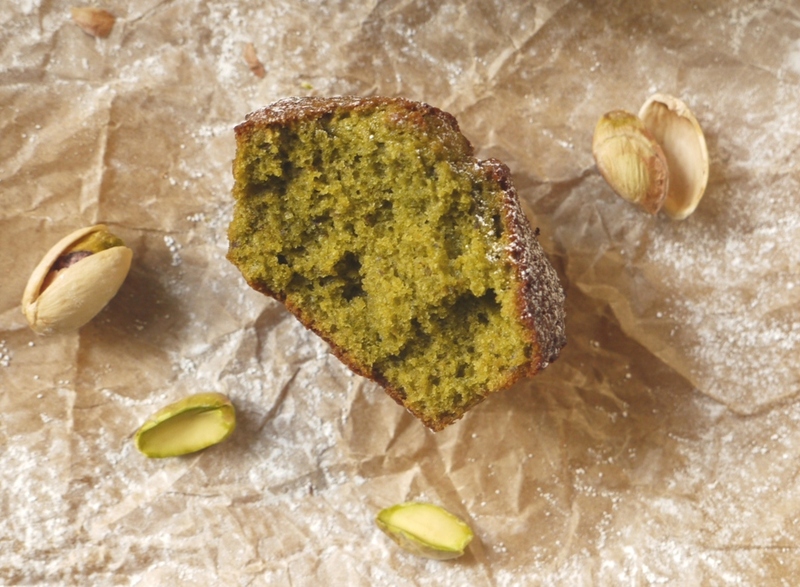 In this recipe I’ve added a little honey, used more pistachio than almonds and added in some matcha green tea powder with its unique flavour and a gorgeous green colour. Breaking open the golden brown crust to reveal a mossy green middle is something you don’t get often in baking, and although my Dad suggested it looked a lot like the interior of a falafel, he still managed seconds so I’m hoping the green is more appealing than off-putting. Next time you’re left with more egg white than you need, forget the meringues and macarons and go straight for these financiers. Up the amount of almonds or experiment with other nuts, swap honey for maple syrup, omit the green tea powder or replace it with cocoa. Just please – whatever you do – don’t make an egg white omelette. Preheat the oven to 220 degrees C. Grease a twelve hole muffin tin or line with silicone or paper cases. Heat the butter until the milk solids turn brown in colour, nutty aromas are released and the clear liquid is a golden amber. Strain into a bowl, discard the browned solids and whisk in the honey. Set aside to cool. In a separate bowl, whisk the egg whites with a pinch of salt until slightly frothy (but nowhere near meringue stage). Sift in the sugar, flour and green tea powder and gently fold to combine. Add the ground pistachios and almonds and fold again. Pour in the melted butter mixture and stir to combine. Divide the batter between your twelve muffin cases, tap on the worksurface to flatten the tops. Bake for 6 minutes before turning the oven down to 200 degrees C and bake for a further 6 – 8 minutes. Turn off the oven and leave the financiers in for a further 5 minutes or so to firm up then remove and allow to cool in their tins a further 5 minutes. Delicious eaten warm or cold, the heavy nut content means these little cakes stay lovely and moist for a couple of days. What a revelation – never knew why they were called ‘fananciers’. Gorgous, informative post, Ditto about the egg white omelette – ! Man I hear you on those egg white omelettes – tried it once, never again! Financiers are a much better way of using up egg whites – already bookmarked a recipe in a new book on French baking I bought to use the egg whites that will be left after the Creme Pat I am planning to make later this week. 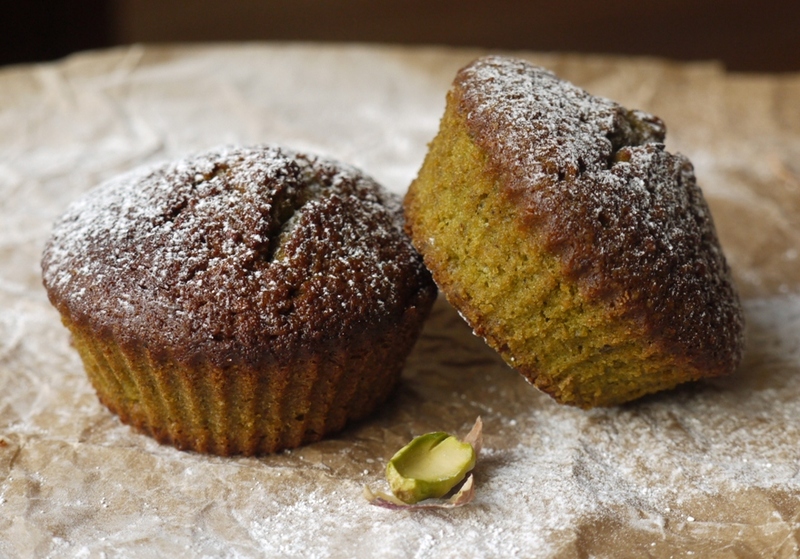 And while I am planning on making walnut financiers I love your pistachio version – the colour from the matcha powder is divine and I love anything pistachio flavour! Walnut financiers sound delicious – will add to my ever growing list! Ooh yes – I’ll take these over an egg white omelette any day! I love financiers/friands – they get better about a day after making too…which is all the encouragement I need to double the batch! Love the colour inside of these. I can only eat an egg white omelette if it is covered in black pepper and cheddar cheese…otherwise it’s like dust. I’ve had financiers on my baking list for ages and these look lovely. Pistachio is one of my favourite flavours as well. Seeing as I ate my weight in salted pistachios today, I am seriously craving some sweet pistachio in my life. Winner! THANK YOU! I have nine egg whites in my freezer and I find meringues quite boring, and I completely share your view on egg white omelettes – I’ve never been able to bring myself to make one. These look amazing, can’t wait to put my egg whites to good use! 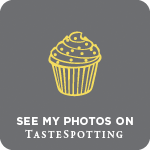 Sychronicity – I have a cup of 4 egg whites that were ear marked for meringues. I already have a box full of meringues made last week. These financiers are the perfect answer. I have no green tea powder, but I do have everything else. Thank you. They will be completely delicious with or without the green tea powder, guaranteed! These look great and a brill way to use up egg whites! Thank you!! I saw your first photo and thought… A gift for me… Thank you. They would be so simple to make completely gluten free, in fact I may try them that way next time! Perfect! A good low calorie cake option! Personally I think it is a fairly bland cake on its own (I like a bit of texture and flavour) but really good with a chocolate sauce / fruit coulis / fresh fruit and cream etc. and I made a chocolate orange version which was delicious (a Paul Newman favourite according to the ‘interweb’!). These look wonderful in texture and in color! 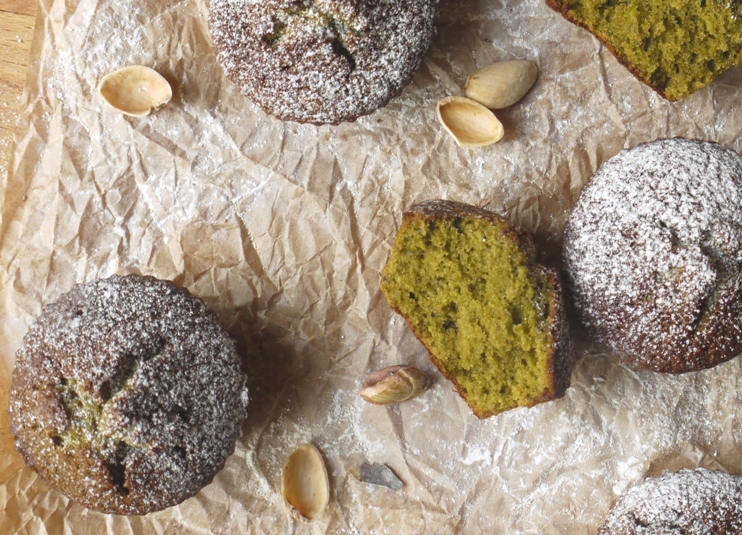 I need to try baking with matcha and since I’m obsessed with pistachios I probably need to just try this recipe! haha, i always scoffed at egg-white omelettes too! 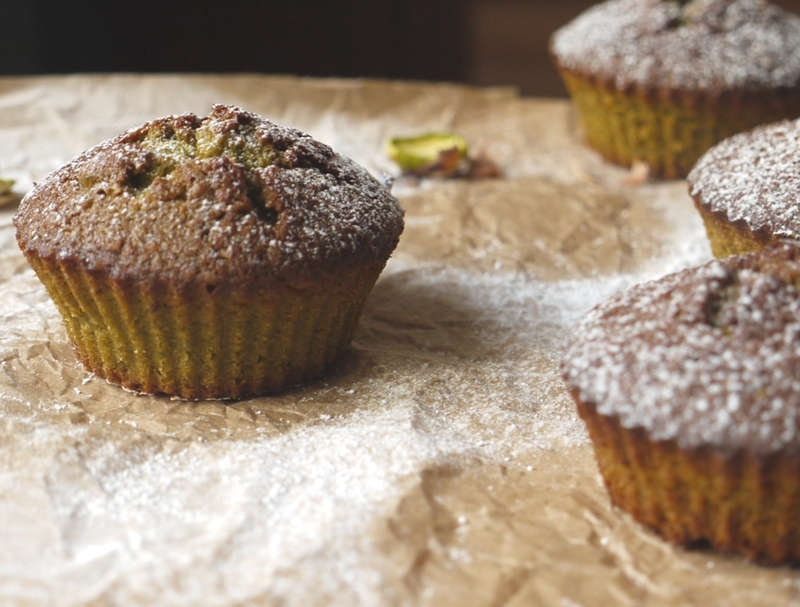 these look gorgeous, i love pistachios and i think adding the matcha powder was genius! I completely agree with you about egg white omelettes! I have some green tea powder left over from making some gelato. I was undecided about whether to make some more or try something else. I will definitely be using it to make some financiers! Matcha powder and pistachio. mmm. LOVE! Given that it’s green, makes it all the more prettier! Going to definitely try this! Mmm these look fantastic! I love the flavours you have going on here. I’d love one right now. I totally agree on the egg white omelettes. I tried one once out of curiosity. Never again. Thanks Jennifer. Glad to see pretty much everyone here agrees on egg white omelettes – such sad little specimens! Couldn’t agree more! I promise I will never make an egg white omelette. Thank you thank you thank you! I’m not a meringue or macaroon fan, and I’m with you and Nora on the egg white omelette, but my family loves molten chocolate lava cakes, which means we find ourselves with extra egg whites on occasion. Now I know what to do with them. Great flavour combination. Financiers sound similar to friands. It seems maybe the difference is the use of beurre noissette. Very good alternative to meringues – and omelettes – for the post-ice cream egg white mountain! I’ve truly never really understood the whole eggwhite debate. I mean seriously, I’d rather have no omelette, then an eggwhite omelette. My favorite way to use eggwhite is usually meringue but these financiers look so good too, so I Might have to give them a go too! Egg white omelettes? Yuck. 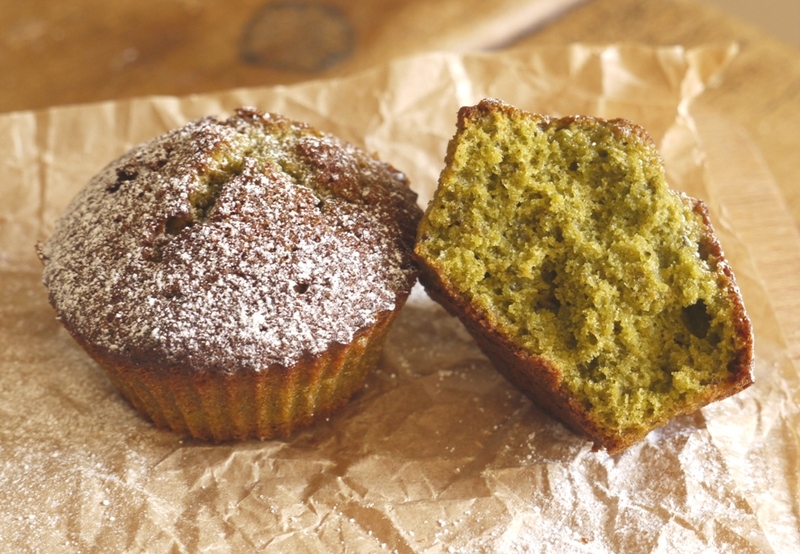 Green, gorgeous financiers? Yum! I love financiers and always choose the over macarons and meringues. Such a good idea! There is only so much meringue I can eat in a short period of time whereas financiers I’m pretty sure I could eat non-stop! oh gahd terrible, those omlettes… Nora was a smart woman… I miss her…. But what I won’t miss is this recipe that is def. being bookmarked cause I want to one day make a binder under the separator of “recipes using up leftover egg whites” hahaha Making a pavlova is nice too… but having the option to make sth. else is always welcome! 🙂 I love pistachios & they’re my favourite macaron flavour, so I’m thinking if I get my hands on some pistachio extract, as in flavouring, to enhance the pistachios inside, that would def. be going in too! Question: do they have a taste of the matcha tea? I am not too fond of it.. Green tea, sure. Matcha… I find a bit too strong…. But I love the colour…. I’d rather omit the food colouring…. Hm…. They taste ever so slightly of matcha but it’s not overpowering, I promise! The pistachios and honey add a lovely, complex, rounded flavour to each bite. At last, a decent egg white recipe. I hate meringues and find macarons a lot of effort for nothing much. I’d rather eat my own head than an egg white omlette – I didn’t even know such a thing existed! In Dan Lepard’s “Short and Sweet” there is a brilliant blueberry and creme fraiche cupcake recipe using egg whites. We ice cream makers need more of this. You’re a star! Ooh, I love Dan’s recipes so will have to look that one up! I have so many egg white in my freezer! what a brilliant way to use them up! I can’t wait to try this recipe! Oh Kate, you´re so right about egg whites, both the omelette and the way to use leftovers. I made almond and also chocolate financiers yesterday for a group, and I´m in love all over again. I had just forgotten about them. Will try this recipe next time, the honey should make them even more tender! Your father is right, they do look like falafels. I made these last night and they were AMAZING! So delicious! Thanks for sharing!